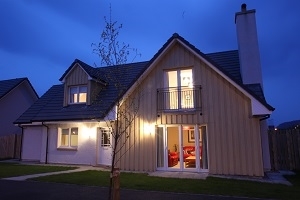 Sleeps up to 8 - Cairn Lodge is a luxury, self-catering four bedroomed property situated in a quiet residential area at the North end of Aviemore Village. The property is a short walk from the centre of Aviemore and a 10 minute drive to Loch Morlich, and a further 5 to Cairngorm Mountain. Perfect for a relaxed getaway, family break, ski holiday or adventure break, Cairn Lodge is the ideal base for your Scottish holiday. Cairn Lodge is a luxury, self-catering four bedroomed property situated in a quiet residental area at the North end of Aviemore Village. The lodge is detached with private and on street parking. It is on two stories, with the main living space and one bedroom downstairs, and the main sleeping accommodation upstairs. Furnished to the highest standard to make your stay fun, relaxing and memorable. Cairn Lodge sleeps 8 guests in four beautifully decorated bedrooms. All bedrooms have Freeview TV’s, wardrobe space and many personal touches. airn Lodge is a luxury, self-catering four bedroomed property situated in a quiet residental area at the North end of Aviemore Village. The property is a short walk from the buzz of central Aviemore, and a 10 minute drive to Loch Morlich, and a further 5 minutes to Cairngorm Mountain. Perfect for a relaxed gataway, family break, ski holiday or adventure break, Cairn Lodge is the ideal base for your Scottish holiday. The lodges’ large luxurious lounge is accessed through double glass doors and has been beautifully furnished with comfortable leather sofas and sylish oak furniture. There is flat screen television, full SKY package, DVD player and music centre/ipod station for your use, along with a selection of books, games and DVD’s for you to enjoy during your stay. Cairn Lodge also has free Wi-Fi to keep in touch and entertain you. the centrepiece of the lounge is a welcoming open fire (The owner leaves a small fire starter pack). Just the place to relax with that warming dram. Cairn Lodges’ kitchen dining area is the centre of the lodge where all the guests congregate. It has been very well designed and comes fully equipped with all of the crockery, cutlery, and glassware needed for maximum occupancy. The cooking area is well equipped with gas hob, oven, microwave, fridge/freezer and the all important dishwasher. The large dining table seats eight comfortably, and there is a wall mounted TV with Wii games console (Bring your own games!! ), so all of the family can also use this area as a games room. Patio doors lead out to a family friendly secure garden area. Cairn Lodge also has a separate utility room which houses a sink, washing machine and tumble dryer. The large master bedroom has king size bed and a stylish en-suite bathroom, the second bedroom also has a king size bed. Bedroom three is a double, and the fourth bedroom is a twin room with 2 single beds. 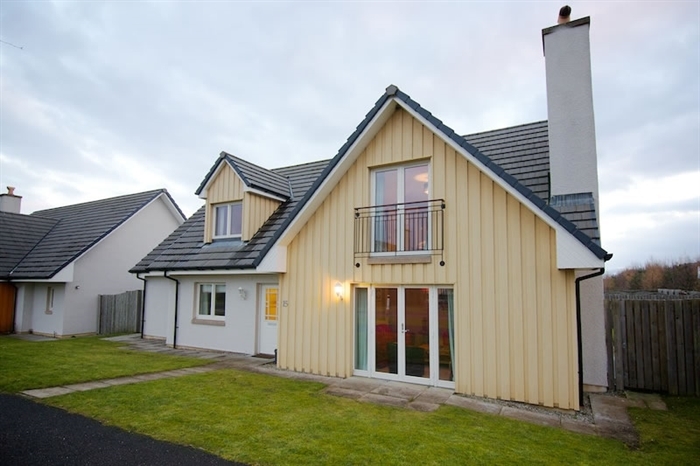 There is a family bathroom upstairs with bath and shower, within easy reach of all the upper floor bedrooms. On the ground floor there is a separate shower room with WC with WHB. This shower room is very tastefully designed with a luxury feel, and really acts as an en-suite for the ground floor twin bedroom. Situated in the garden area is a fabulous 5 person hot tub. Just a fabulous place to relax and unwind after an energetic day of activities. The views from the garden are of the Monadhliath mountains and beyond. This area, which catches the late afternoon and evening sun also has an outside table for BBQ and Al Fresco dining, and for that evening sundowner. Golfing, cycling, skiing &snowboarding,walking and climbing, canoeing & kayaking Gorge walking, Sailing & Windsurfing, Highland Wildlife Park, Cairngorm Mountain Railway, Reindeer Centre, Landmark Woodland playground, Horse riding, Gliding, Salmon and Trout fishing Loch an Eilean Pottery.